School teaches kids many things they need to know, but most schools really lack in common sense money lessons. Kids learn all sorts of math over the years, but rarely does it actually help them learn money principals that will set them up for a bright financial future. Today, we are going to list several lessons that are not taught in school and how you can teach them to your kids so they will be smart with money. When it comes to money, self-discipline is the key to success. Schools today don’t teach the value of self-discipline in your finances. Kids need to know how to have enough discipline to create and stick to a budget, save money, and how to delay instant gratification. This is one of the most important lessons they can learn. If they don’t learn how to be self-disciplined at an early age, it will be extremely hard for them to learn that skill as an adult, and the lack of self-disciple can sneak into other areas of their life as well. As parents, you can teach them how to be self-disciplined by teaching them how to set money goals for the money they have. If they have a certain goal to attain, they will learn the importance of saving for that goal, which will in turn teach them delayed gratification. This will get them on the right track to learning how to be self-disciplined with money. We’ve all heard the parental joke, “Do you think money grows on trees?” but in reality, that brings up a valid point. Do your kids know where money comes from? Chances are they know what money is (and that they like it), but if they are young, they probably don’t understand how you get it. The lesson they need to learn is that money comes from hard work. Instilling a work ethic at an early age is not only good for the financial side of things, but it is important in all areas of life. As parents, you need to teach your kids that money isn’t just going to come in without any effort. A great way to get this lesson started is to give your kids age-appropriate chores and then pay them per job completed. Set up a chore chart, and equate every job with a certain amount of money. It’s simple, if the kid does the job, they get the money. This teaches them the value that income comes from work. Debt is one of those topics that everyone has different opinions on, but one thing we probably all agree on is that too much debt is bad. Kids today grow up in a “give me” society. They want what they want, and there is always a loan or credit card that can give them what they want instantly. What is perhaps most tragic about this scenario is that kids aren’t being taught the consequences of saying “yes” to debt. It is up to parents to teach their kids about high interest rates on credit cards and what happens if you don’t pay your debt back. Another great lesson to teach them is that while you really should try to have the money to pay for everything up front, some debts like student loans and mortgages are not as bad if you have the money to make the payments. The way to teach them these things is to lead by example. Talk to them about debt, and show them the ways you stay out of debt or actively pay debt off. Let them see that this is an important topic to you and more than likely, it will become important to them too. Giving back is a money lesson that usually isn’t taught in schools. As important as saving money is, it is also important for kids to learn to give charitably when possible. There are different ways to teach this lesson to your kids. First, you can show them how you are giving charitably by involving them in the process. You could sponsor a kid through an organization and keep their picture where everyone in the house can see it. When the kids look at it, take that opportunity to talk about all the ways your giving helps that particular person. Another way to get your kids involved is to let them give out of their own money. Whenever they receive money, show them how to put a little aside to give towards the family charity project or to your church if you attend one. Teaching them early that giving, even if all you can give is just a little amount, is important will radically impact the way they view money when they are older. All of these lessons are extremely important to raising your child to be responsible with money. 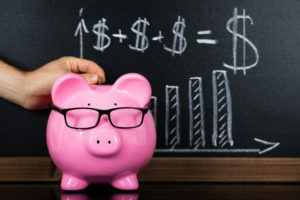 Yes, there are many more money lessons your kids will need to learn over the course of their life, but if you instill these four lessons at an early age, they will be set up to be financially smart in the future.